You can use the Skew tool to distort your elements on the x and y axis. Select Animation > Tools > Skew. 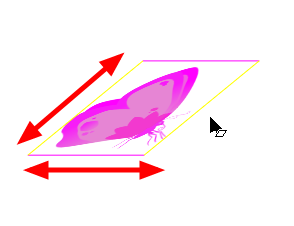 In the Advanced Animation toolbar, click the Skew tool. In the Camera view, Ctrl + click (Windows/Linux) or ⌘ + click (macOS) on the element to select it and drag a side of the bounding box up, down or sideways.